← Cyclists Pay For Our Roads, Too! What to do with streets? I read an intresting article called The Great Debate: Vehicular vs. Segregated Cycling by Stacey Moses which introduces the debate over what to do with streets. Is it better to integrate bicycles by treating them the same as cars for the purposes of position in the street, or would it be better for the bicycles to separate them with special lanes or a physical separation like concrete? I wonder. The official stance of ABC, I believe, is to follow what was laid out in the Albany Bicycle Master Plan which advocates for bike lanes from the physically separated to the integrated. Most bikers will tell you, especially the ones that are just starting to ride in traffic, that they prefer bike lanes to riding in the same lanes as cars. For most cases I would say, at least for me, that this is true. When I am riding down Central Ave. I say a prayer the entire way that some car does not side swipe me onto the sidewalk, and believe me this almost happened a few times. Although there have been time where I have found it easier to ride in front of cars on a four lane road then take to the sidewalk. I have talked to many people about this, drivers and cyclists alike, and from a driver’s prospective the most prevalent and pervasive comment is that, “Bicycles should not be in the road anyway” to which spawn a twenty minuet “your wrong” fest in which no side really makes any headway. So are bike lanes the answer, or is that admitting to the drivers out they that, “Yeah we don’t belong on the road. So we have to change the road to accommodate ourselves?” Maybe riding with traffic is the way to go to say to motorists that we do belong in the road and we are here weather you like it or not, something the Critical Mass event seems to be trying to do. Who knows? If we had the answer it would not be a debate. All we can do is look at what other people have done and try to emulate what works. I encourage you to read the article and decide for yourself. Also, check out the comments at the bottom. Some of the people make good points. If you have something to say pleas feel free to leave a comment. As with most debates, it isn’t likely a black or white answer. If you look at the so-called cycling meccas, such as Amsterdam or Copenhagen, they use a mixed model. Isolated bikeways act as highways for bicycles, moving them across longer distances faster. High traffic streets use a combination of standard bike lanes or separated/protected lanes not only to protect cyclists (accidents in these cities are so minimal already), but to allow traffic to flow better. But, for low traffic or residential roads, there is no special infrastructure. Road users are expected to respect one another and share the space. In this case, vehicular cycling would apply. I think that’s the ideal most people should strive for. If 50% of people commuted by bike, they would effectively take an entire lane of a road on a two-lane road, right? So why not make that lane the proper width and not treat them like a car in that situation? That’s how the areas with high numbers of cyclists handle it. The bigger question is how to evolve infrastructure in a city with a low number of cyclists which allows for growth by virtue of making the roadways safer. 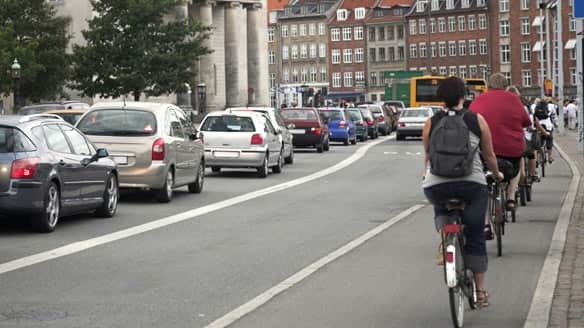 It’s hard to justify Copenhagen-esque bicycle infrastructure without cyclists lined up to use it, so you end up with the chicken and egg problem. I was sad when ABC came out in support of sharrows over bike lanes last winter. To me, sharrows have all the downsides of bike lanes with few of the upsides. I’m personally comfortable in traffic, but feel that I would be safer with more bike-specific space on the road and that more people would bike if the infrastructure existed… effectively making the roads safer for all of us. ABC was divided on the issue of Sharrows vs Bike lanes vs no marking at all! These issues have been discussed by ABC for the past four years. The fact that Albany even has Sharrows is a big step forward and we count this as a victory for bicyclists. How many other communites adjacent to Albany have as many bicycle markings on their streets? It’s not that ABC is supporting sharrows over bike lanes as a matter of principle, but rather that in some situations it’s the best we can hope for. If you look at the case with Delaware, there were no considerations for cyclists in their initial plans. A lot of core ABCers pushed hard for bike lanes and really put pressure on the city (some crashed the construction ribbon-cutting with shirts asking for bike lanes on). But when it came down to it, we couldn’t get them to give up on-street parking. We deserve our fair space, but sometimes we need to compromise. In areas where there is space, we will be less likely to cede to sharrows (such as Western). But on a road like Fuller? Here, our options are much more limited, and sharrows may be our best bet. Sharrows do a lot of good. They let motorists know that you have the right to take the lane, if there’s no shoulder, and prevent cyclists from riding dangerously, among many other benefits. Hopefully, as more people get out on bikes, priorities will shift. If you look at Portland, with something like 15% modeshare of bicycles now, sharrows in some areas are being removed in favor of lanes, and even segregated bikeways. As frustrating as it may be, evolution is often more practical than revolution. “The consensus was that ABC favors Shared Lanes over Bicycle Lanes in those cases where there is a clear choice. – Putting shared Lanes “everywhere in Albany” (i.e., on the majority of heavily traveled streets) would enhance awareness by both motor vehicle operators and cyclists.